Today some children in our neighbeorhood are have a little driveway sale of toys and books. I don’t think I need to go buy more books, and all the children we know are getting rid of the same toys these boys are selling! But it made me think of the books we have in our house, and the ones we read and don’t read. But Susan Hill writes much more than detective fiction. In fact, these novels are a later genre for her. She is famous for her ghost stories, especially The Woman in Black, which is required for the secondary school certificate examinations in the UK. She also writes children’s books, and has won many awards and been short-listed for the Booker Prize. And a couple years ago she started her own publishing company, Long Barn (and Little Barn) Press. 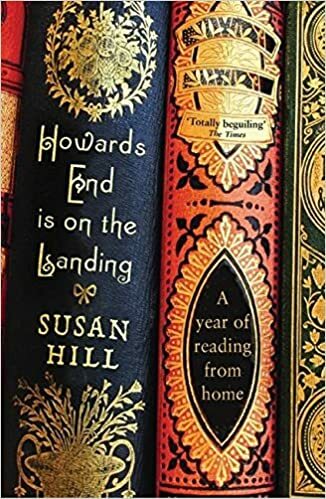 One book of hers that caught my attention a few years ago is Howard’s Is on the Landing: A Year of Reading from Home. She determined one day, when she found a book she had been looking for in a pile on the landing, that she would spend one year only reading books already in her home. It’s a lovely book, and a wonderful exploration of books she’s loved (and not loved so much) over the years. I was totally intrigued by this process, and briefly considered trying it myself. I just might do that one of these years! She has a sequel to Howard’s End Is on the Landing coming out in October, Jacob’s Room Is Full of Books. I’ll look forward to reading this edition as well. You can learn more about Susan Hill at www.susanhill.org.uk. I read Howard’s End on the Landing, but when I tried to read my books at home it only lasted a few weeks.